Our patented MAXbend® retrofit locally re-homogenises a segregated slurry flow within a pipe. The technology is placed immediately upstream of bends in a slurry pipeline so as to reduce wear on the inside of the outer radius of the bend. The MAXbend® remedy involves the use of the energy within the carrying phase and a ‘point of dispersion’ device to create a flow profile that redistributes the solids into the ‘bulk flow’ such that the redistribution persists through the bend, moderating the ‘higher collisions per unit area’ phenomena on the inside surface of the bend. MAXbend® reduces costs. Such erosive wear of bends is a function of the abrasiveness of the mineral particles, the resistance of the material that forms the inner surface of the bend, and the nature of the interaction between the two. Existing approaches to solving this problem are predominantly based on lining bends with rubber, hard metal or ceramic material. Studies have reported that such problems cost the mining industry a figure in the order of US$10 billion per annum worldwide. MAXbend® is the first ‘cause based’ remedy for bend wear reduction and as such the reduction in wear is ‘beyond belief’, as described by more than one customer. 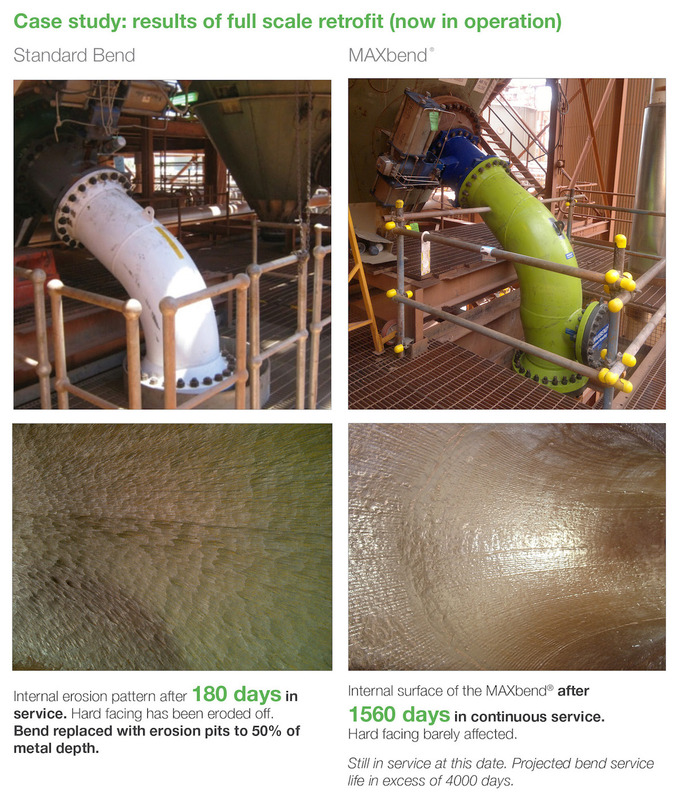 The case study is an installation of the MAXbend® Technology in an Alumina refinery. This bend has been applied to a slurry stream operating in three phase flow. Due to the high temperature of the stream and the flash valve located directly after the bend flashing occurs, this causes a high velocity bubble zone which in turn allows the particles to impact the internal wall of the pipe (shown in lower left photo) on an angle which gouges the protective layer. The photo on the lower right shows the internals of the MAXbend® subject to the same three phase flow conditions. The slurry particles are now passing through the bend on a less aggressive angle. As a result of the PROmotion® technology applied to the bend, stream scale is building onto hard facing and being polished by the slurry particles passing; now the scale is protecting the hard facing previously being gouged in the standard bend. MAXbend® can be installed in any pipe or transportation conduit specification. Any schedule or class of pipe conduit can be applied to suit the required duty and MAXbend® can be manufactured from any material suitable to the process, including: Carbon steel, HDPE, Ceramic and Titanium. Linings or hard facing can also be applied. Our bend wear solution can be retrofitted to existing lines or installed in new systems. The potential applications for MAXbend® technology throughout industries involved in the transportation of solids are many and varied. These include but are not limited to, tailings systems, classification circuits, waste treatment, concentrate pumping and oil & gas.